The Growers Exchange herb garden is under going it’s fall make over. Most of the annuals have been removed: several frosts left basil looking limp. 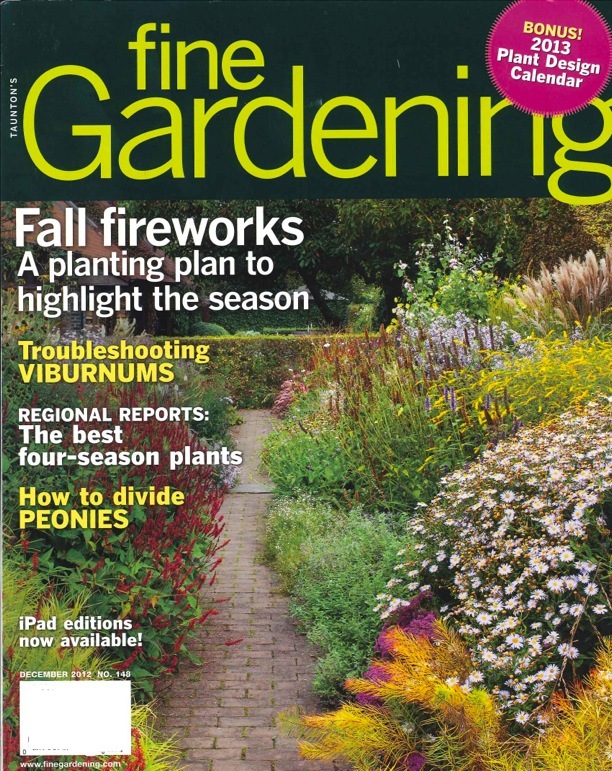 Fall is the best time to move and divide perennials. Having substituted all the flowering plants with herb plants, we must study their garden characteristics just as with plants grown strictly for flowers. The border along our office wall needed a new screening plant at the back of the bed. We were looking for a tall green plant to high light the shorter herbs growing in front. We could have easily chosen fennel in green or bronze to block the white wall, but they are already being used are center specimens in island beds. Lovage is another plant with potential for screening. 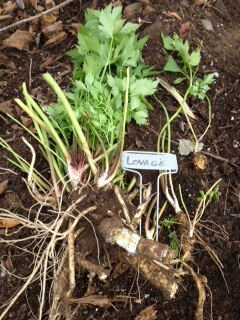 The lovage in the photo was dug from another place in the garden. Along with the main clump, we divided off four smaller plants. These will be set out to catch up with the parent. If needed, the main clump could have been divided again into four or five smaller plants. In this case we wanted one large plant. If you have a lovage plant that requires moving or dividing, fall is the best time. The plant will establish roots until the ground freezes; this will produce a larger plant the following spring. To promote root growth an organic fertilizer should be applied. It all started with questions I was getting from customers about growing outdoor herbs in the winter. Because we strive to provide an exchange of information for all types of growers, I was more than happy to help. 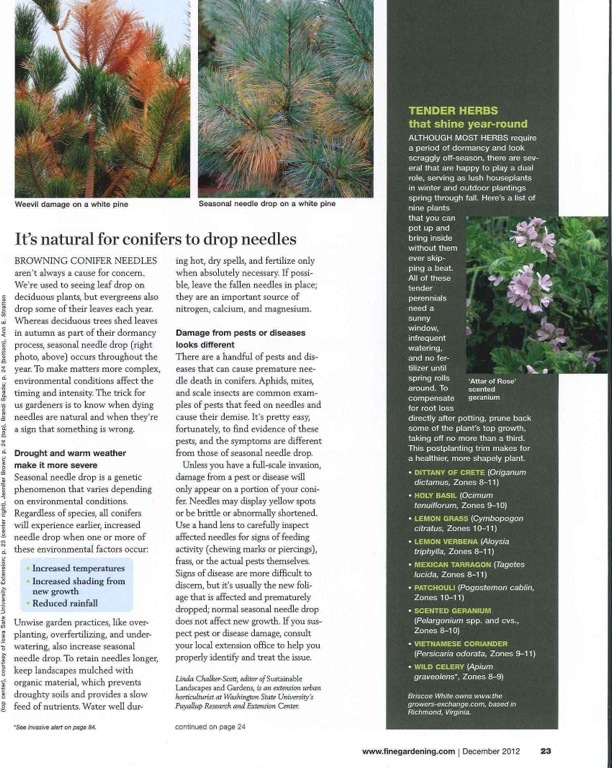 Fine Gardening was getting the same questions from their readers that we were getting from our customers, so they picked up my article and used it in their December 2012 edition to help reach more growers who were having the same questions. Enjoy fresh flavor for all of your hearty winter dishes. Choose the healthiest plants and compost the others. Dig plants carefully, saving a generous root ball. Leave plants outside for a few days to acclimate to their new containers. Choose a sunny location with 6-8 hours of direct sun. Consider temperature and humidity. Don’t place them where they will dry out quickly or be in a cold, drafty spot. Typically herbs don’t need a lot of water. Check soil by sticking your finger about a half inch in to test for moisture. Don’t be alarmed if your herb plants lose their lower leaves as this is the plant’s way of dealing with the change and getting rid of leaves that no longer produce enough food. Lemon Verbena is especially likely to do this. Which herbs will work best indoors? Dormancy requirements make some plants better choices. 6 plants that are used for extended harvest. After the last frost, usually late April or early May, start placing potted herbs outside during the day so they get accustomed to a new climate. Keep an eye on night temperatures. Begin to leave them out when night temperatures are above 50F. Chamomile a weed? One person’s weed is another person’s herb! While on a trip to Prairie Canada, I was surprised to find find common chamomile blooming among the prairie plants. After first spotting this familiar herb, I began seeing it along the road shoulder, in fields of peas and beans, and even in the lawn where I was staying. From my host, I learned that on the prairie farmers consider chamomile a noxious weed and work hard trying to eliminate it from their crops fields. This is a good example for comparing a desirable herb plant from a weed. And as the description for weeds explains; it all depends on where a plant is growing! 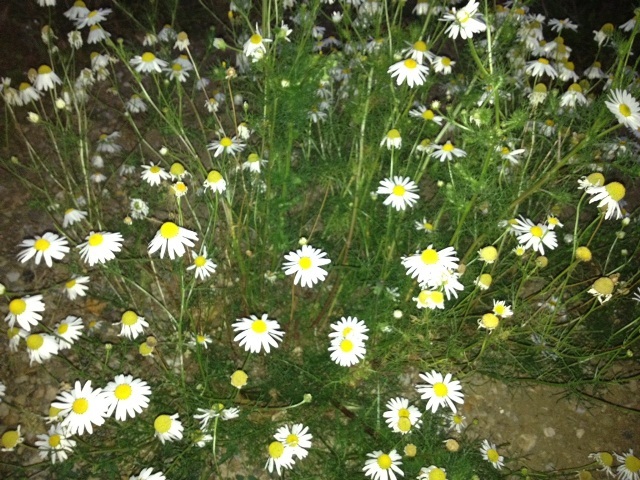 So even though chamomile is a weed is some places, it is a welcome herb in my garden. I have plenty of other plants on my own weed list! I never thought our Year in the Life of a Garden would be raided by varmints, but it was last night. 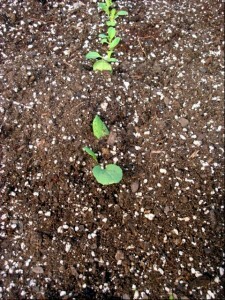 I cannot tell what it was that dug into a row of Pak Choi seedlings and buried some Arugula with their tailings. Damage was slight and what ever came rooting around did not find much of interest in our salad bed. My guess is that it was a raccoon or opossum attracted by the kelp meal fertilizer. Maybe it is better not to use fish fertilizer, as that will surely bring curious diggers. Another little lesson we have learned in this spring garden in that using old seeds is risky. We sowed extra because the seeds were two years old, but none of the Spicy Mesculin Mix lettuce seeds germinated. Today I sowed fresh seed into that row and we should still have plenty of time to grow lettuce for cutting. I think next I will add a few herb plants around the borders, maybe a basil plant in the center. The logs surrounding the bed are impregnated with mushroom so we hope to harvest some interesting salad makings soon! We have always wanted a place where all the plants grown in our nursery could be grown out to full size. Now that all of our time is spent working from the nursery, we found the time to dig up the yard surrounding it. Because time is always hard to find for such projects, we have been taking our time. Shrubs were planted the first year and later a waterfall was added. 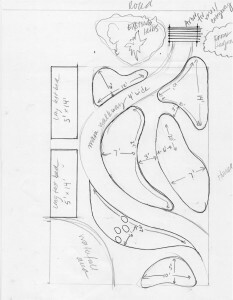 Now we have laid out the paths and beds on the ground and will begin preparing the beds for planting. It may be fall before we have them ready. Not being in a hurry, we want to dig deep and work plenty of organic material into the soil. Only when the beds are finished will we begin to add herb plants and some perennial flowering plants. Piecemeal is always the way to tackle a large job, so we will finish some beds before others are started. This way we will be able to grow some of our flowering annual plants. Cut flowers like zinnias and celosia will provide fresh cut flowers for the office. We want to demonstrate all the ways our plants can be grown. Every step will be documented: from soil and bed preparation, planning and planting, to care and harvest. Check out The Growers-Exchange.com for all of our Year in the Life of a Garden updates. Looking at the salad patch this morning I was pleased to see we had a good stand of seedlings. Using a cold frame for early season protection, we get a month or more growing time over outside. The plants are also safe from wind and rain. A windy cold day outside is warm inside the cold frame. It is amazing the difference a sheet of plastic makes. Finally I can begin to report on plant progress, not just winter preparations. Growing now we have most of what we need for a salad. Leafy greens come in all shapes and flavors so we have a good selection. Lettuces are represented by: Braising Mix, Wildfire Mix, Spicy Mesculin, and All Greens Mix. Check out the details on our site. Even though they are herb plants, I am adding Salad Burnet and Sorrel for their distinct flavors. 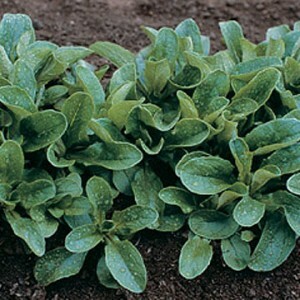 Last but not least is Arugula for spicy greens. The plants are growing so it will not be but a few weeks before we will be cutting and tasting these greens, spring is really here!! In the greenhouse this week we started four types of melons and two cucumbers, these will be planted in the cold frame beds when night temperatures are warmer. The plan is to train the vines to climb the cold frame bows, melons will be supported in little hammocks. Watch the garden grow, and let us know some of your gardening ideas.